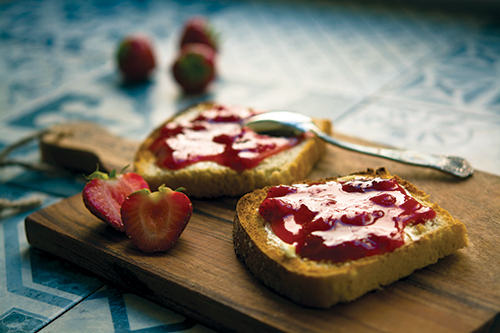 Think of Smucker’s® and the sweet stickiness of strawberry jam, the tartness of raspberry preserves, or the satisfying pop of the gingham-patterned lid coming off of a fresh jar of apricot spread. Each of those jars of jam bears the distinctive signature of Jerome Monroe Smucker. To most of the world, he is known as the founder of The J.M. Smucker Company. To Mark T. Smucker ’92, he is great-great grandpa. In May 2016, Smucker became the fifth-generation president and CEO, taking the reins from his uncle and father. It’s a role he didn’t imagine he’d find himself in when he was a student at William & Mary, pursuing a geology degree and proving to himself that he could forge his own path. But his story, and that of The J.M. Smucker Company, is one of growth and the power of family. Orrville, Ohio, is a little town about 30 miles southwest of Akron with approximately 8,500 residents. It’s home to The J.M. Smucker Company and generations of the Smucker family. Smucker has fond memories of living in Orrville when he was a child. One of his earliest memories is of the Jelly Jamboree, a local festival sponsored by the company and featuring softball in the park. In middle and high school, he and his siblings and cousins all worked summers at the company, doing everything from janitorial work to quality control to marketing and sales. The family business became more than just fun and games. Enter William & Mary, a school 500 miles from home and just the right size: at the time, approximately 5,000 students, smaller (though not by much) than his hometown he left behind. It was, and is, also a renowned liberal arts university. Smucker wanted to explore his academic interests and he knew William & Mary was the place to do it. “My parents were good at encouraging us to do what we wanted to. They would always say, ‘Look, you can always come back to the family business, but you should really branch out and do what you like,’” says Smucker. At William & Mary, he was known as “Smuck,” living in Yates 241 with Christopher Almond ’92. Their freshman floor was mostly occupied by other out-of-state students, so they bonded over being far from home. Smucker became a geology major, expanding on skills he had developed as president of the earth science club at his high school. He went on field trips around Virginia and kept interesting rocks in his dorm room, happily enthusing to Almond about his coursework. He was also the first person in their dorm to have his own computer, a Macintosh. Occasionally, his family would send Smucker and Almond samples of products for them to taste-test. “They were pretty wild — banana juice was not particularly appetizing — but it was clear that he had a wonderful family who wanted to stay involved,” Almond says. Once, Almond locked himself out of his room, and Smucker, annoyed with Almond’s absentmindedness, refused to let him in until Almond jokingly threatened to go to the grocery store and buy all the Welch’s jelly. After his freshman year, Smucker moved into the Psi Upsilon house on campus, and he and Almond lost touch. It wasn’t until 2017 that Almond and Smucker reconnected over the sudden death of one of their freshman hallmates. They reminisced about their 25 years since graduation — Almond became a cardiologist and associate professor at Stanford University in Palo Alto, California, and Smucker became CEO, despite telling Almond in college that he wasn’t going to enter the family business. In 1992, with his future unclear, Smucker graduated from William & Mary and started looking for jobs that would use his geology degree and literature minor. That’s how he ended up teaching high school science in Alabama for two years. Before long, though, his travel bug returned, having been nurtured at William & Mary through study abroad and interactions with international students. After two years of teaching, he wanted to go out and see more of the world. He went back to school for his masters in international management from Thunderbird in Phoenix, then moved to Argentina for a position at an advertising agency. 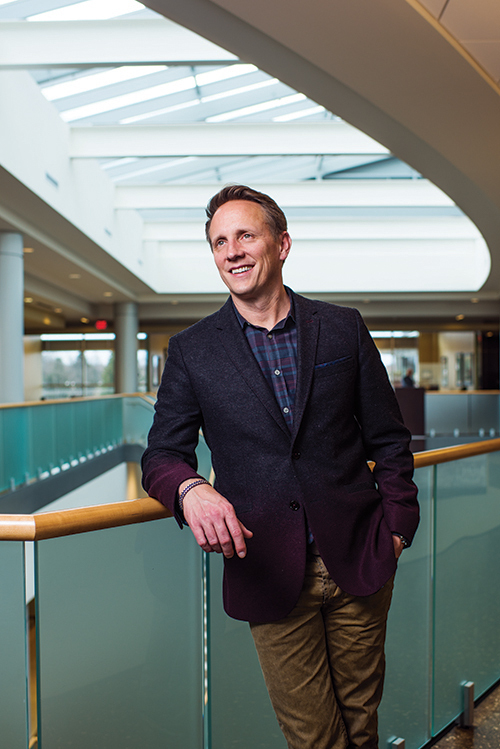 THAT’S MY JAM: In May 2016, Mark T. Smucker ’92 took the helm of The J.M. Smucker Company, based in Orrville, Ohio. He stayed in Argentina for four years, became fluent in Spanish and met his wife, Katie, an ex-pat from Colorado who at the time was living in Mexico City. They married and moved to Brazil. While he was in Argentina, the pressure to return to Smucker grew. Although the partnership never ended up happening, he continued to serve in the International Markets division, a position that allowed him to travel and live in countries around the world. Jammin’: While The J.M. Smucker Company produces and distributes a wide variety of brands, they are best known for their Smucker’s brand of jams, jellies and preserves. Though it’s jars of jam that bear the J.M. Smucker signature, after Mark Smucker joined the company in 1997, the company diversified into markets beyond fruit spreads. After all, The J.M. Smucker Company proudly states it has been “growing since 1897” — they now manufacture and distribute food and beverage brands like Folgers®, Pillsbury®, Jif® and Crisco®; pet brands including MilkBone®, Natural Balance®, 9 Lives® and Meow Mix®; Canadian brands Robin Hood®, Carnation®, Five Roses® and Bick’s®; and many, many more. Why these brands in particular? They are what Mark Smucker calls “beloved brands,” well-known by American families. The J.M. Smucker Company, after all, is a family business. One of those brands is Folgers, part of Americans’ morning routines for decades. The J.M. Smucker Company purchased Folgers from Procter & Gamble in 2008 in a deal valued at almost $3 billion. They also manufacture and distribute Café Bustelo® and Dunkin’ Donuts® retail packaged coffee (the beans or ground coffee available at the grocery store). In 2011, Mark Smucker became president of the U.S. Retail Coffee division, overseeing these brands. He brought to the role the expertise he had gained from stints heading up the Brazilian, South American, Canadian, international and special markets. It was during the Folgers coffee acquisition that Smucker became involved with William & Mary once again. In 2007, he was invited by the Raymond A. Mason School of Business to reengage with his alma mater. That year, he spoke on trends in consumer behavior as the keynote for the Career Acceleration Modules, which are immersive seven-week experiences for MBA students. He wanted to return the next year, but negotiations with Procter & Gamble were all-consuming and he couldn’t be away from the office. So, Smucker invited the students out to Ohio to meet with him and the advertising agency Saatchi & Saatchi NY. Afterward, he treated the group to dinner in Akron, mingling with the students and answering their questions. He found time to share his expertise even in the midst of acquiring Folgers. Lisa Szykman, associate professor of marketing, consumer behavior and advertising at the Raymond A. Mason School of Business, accompanied students on the trip. “Mark Smucker is a great friend to the school. He’s so busy, but anything we’ve asked, he doesn’t hesitate,” says Szykman. She says she still teaches concepts she discussed with Smucker on that trip in her classes. Laura Peñalver ’16 was a student in Szykman’s marketing class in 2014. A major project in that class is to write marketing plans for real-life companies, and Szykman assigned The J.M. Smucker Company to Peñalver. Szykman put her in contact with Mark Smucker. After her summer i nternship, Peñalver became a business analyst for the Café Bustelo® coffee brand and is now an analyst for the Folgers brand. “W&M reinforced the importance of supporting your peers and acting compassionately whenever possible. That sense of community has been fostered here at the J.M. Smucker Company by Mark and his family, making the transition seamless,” she says. As they say, coffee brings people together. Treating employees well is one of the hallmarks of the Smucker company and one Mark Smucker takes very seriously. In 2016, the year Smucker became CEO, The J.M. Smucker Company was rated No. 6 on Indeed’s “Top Companies to Work for in 2016” survey, making it the “best reviewed food company in America,” according to Indeed. This speaks to the inherent tension in family businesses, especially those closely held over many decades — how to balance the needs and vision of the founding family with those of the employees, shareholders and consumers. “I think my primary responsibility, if I could boil it down to one thing, is being a steward of our company and our brands so that it grows and survives to the next generation. We’re a public company. We have to answer to our shareholders and our investors, some of which are family but most of which are not,” Smucker says. A family affair: The J.M. 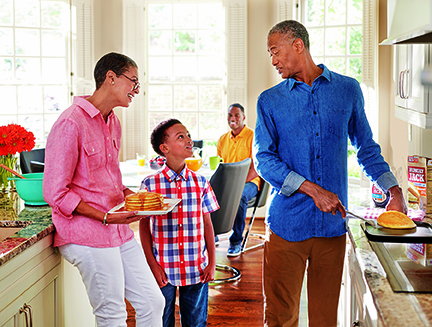 Smucker Company’s vision for corporate responsibility includes encouraging families to spend quality time together over meals. This purpose is emphasized in their Mealtime Movement campaign, which unexpectedly claims “the most important thing isn’t what’s on the table” (even if it’s Smucker’s® products). Instead, “Meals feed the body. Mealtime feeds the relationship.” Mealtimemovement.com displays statistics showing the benefits of family meals on children: reducing obesity, building trust, encouraging thoughtfulness and more. So with all his responsibilities as CEO, does Smucker have time to have meals at home with his family, Jackson, 15, and Phoebe, 13? “It’s hard in this day and age where kids’ extracurricular activities are so much more intense than when I grew up. But yes, we do have family meals,” he says. Smucker even cooks. His specialty is “atomically spicy” Jamaican jerk chicken. Family meals are a tradition that was instilled in him by his own parents. “My mom used to get mad if my dad wasn’t home in time for dinner, and we only lived five minutes from the office,” he says, laughing. The Mealtime Movement is part of The J.M. Smucker Company’s corporate responsibility strategy, which is their vision for “creating a better tomorrow” by focusing on preserving their culture, ensuring long-term economic viability, limiting environmental impact, and being socially responsible. Much of this involves being a contributing member of the communities J.M. Smucker is part of, from Orrville, Ohio, to factories in North America. And yet, being a house of brands instead of a branded house — that is, The J.M. Smucker Company owns many brands, but they aren’t associated in customer’s minds with the company as a whole — creates a challenge for the company. Publicizing sustainability and corporate responsibility efforts to consumers of Jif peanut butter or Crisco cooking oils, for example, is more complicated if those consumers don’t know that The J.M. Smucker Company makes those products. Another challenge Smucker faces is catching up with changing consumer preferences. His focus since becoming CEO has been capturing small, emerging “craft” brands and ensuring The J.M. Smucker Company has offerings that are natural and organic. With that in mind, Smucker has acquired brands like Sahale Snacks®, which makes roasted nuts in exotic flavors and Santa Cruz Organic® brand, among others. Though The J.M. Smucker Company has experienced steady profits, he hopes these new acquisitions will keep the company viable well into the future. Smucker has certainly come a long way from that undergraduate student who never thought he’d get into the family business. “I wanted to prove to myself that I could do things on my own. I could find a job on my own, pursue a career on my own, and that I could do that without the help of my family,” Smucker says. And that is what he did, successfully. But seeing the inner workings of the company that is his family’s legacy, Smucker now embraces his role in the future of The J.M. Smucker Company. And what a career — from helping with one ultimately unrealized merger in South America to overseeing the acquisition of more than a dozen food brands, Smucker is just getting started . After all, with a name like Smucker’s, it has to be good ® .